This section includes a general discussion and a brief historical trace of the improvements that were made to pot stills over the last 200 years. Particularly those which lead to the technology incorporated in the modern reflux still. If you'd rather move on, then please click here. The pot still was the only distillation method known for almost 2000 years. But that all changed whenf the reflux column matured to the point of practicality during the late 19th century. That development revolutionized the production of many valuable petroleum and chemical products that we commonly use today. The reflux still differs from a pot still in that it employs a column fitted with internal trays or packing to provide a large surface area inside. This allows the distillate vapors from a boiler to rise up the column to the top where the vapors are condensed. The condensed liquid is then allowed to run back down through the rising vapors. As the condensed liquid cascades back down through the trays or packing, it becomes enriched by the rising vapors in the column. As the descending liquid passes down the column a point is reached where the temperatures become hot enough that the liquid boils again. This process is called a reflux cycle. As this cycle continues, the mixture inside the tower is effectively re-distilled many times. The reflux still is not a single invention that just happened after almost 2000 years of working with a pot still. It came about by a rapid series of developments all within about a100 year span of history. 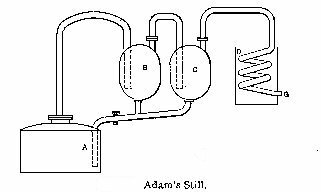 Edward Adam introduced an industrial scale still in 1801 that featured several intermediate tanks between the boiler and the final condenser. The still worked by allowing some of the less volatile vapors from the boiler to be partially condensed in the first tank, while the more volatile components were passed on into the second. New steam from the boiler was then forced to percolate through the condensed alcohol in the tanks before it was finally collected by passing through a condensing coil at the end. Allowing the boiler vapors to percolate through the alcohol not only conserved energy, but greatly strengthened the distillate that was collected. This was most likely the first commercial implementation of the doubler tank, which became more widely known by moonshiners as a thumper keg. The still also provided controls that allowed portions of the distillate from both tanks to be re-circulated back into the boiler for re-distillation. That is a fundamental process involved in all modern reflux distillation operations. There were some problems with this still though, mainly because of the difficulty in controlling the temperature of the doubler vessels, and the bubbling of vapors through the liquor created too high a pressure in the tanks. Nevertheless, the Adam still was quite successful, and provided great profit to the inventor for many years. Naturally, this made it widely imitated, and many improvements were incorporated into the basic design very quickly. 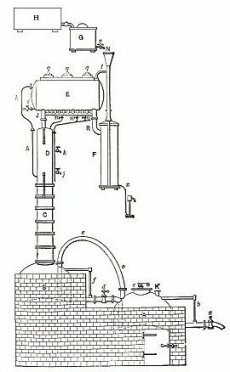 Perhaps the most well known was Corty's Patent Simplified Distilling Apparatus which is shown below. 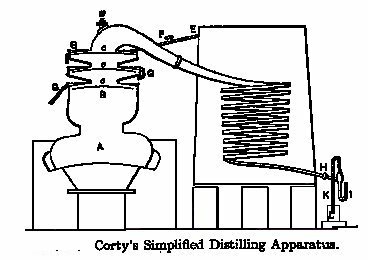 Corty's apparatus incorporated the external doubler vessels of the Adams still into a column structure located on the still head. The doubler tanks now took the form of three water cooled plates built into the column. These plates are not unlike those found in modern reflux distillation columns. They served as internal condensing surfaces, allowing the distillate to cascade down inside the still and mix with the rising vapors from the boiler. This resulted in the purest distillate forming on the top plate before being drawn off for collection. Another feature of this still was that it claimed to conserve fuel because it operated under a partial vacuum created by the final condenser which was sealed from the air. Perhaps this might have been the first practical use of a partial vacuum distillation. These two early industrial era stills were important steps in the advancement of distillation technology primarily because they incorporated the concept of having part of the distillate returned to the heating source for re-distillation, and they also provided a means to allow the boiler vapors to percolate through the partially condensed alcohol as it was returning to the boiler. That flow is called reflux. It is the hallmark of the still and it produces a much purer product with a single distillation run than the pot still. The next most important development came with the Cellier-Blumenthal still. This still incorporated almost all of the general principles of the stills currently in use today. Its most important feature is that it was designed to operate continuously. That is to say that once in operation, the material to be distilled is entered continuously at one part of the apparatus, and an appropriate amount of distillate is recovered continuously as output. The continuous operation concept provided an enormous improvement in both time and energy costs over previous still designs. The still also incorporated an overhead condenser with a reflux holding tank. This device allowed the distillate to be collected there and then split into a reflux stream going back to the column or another stream going to the collection of the output. Perhaps more importantly, the design allowed for a more rigorous scientific examination with the principles of Thermodynamics developed during that era. This lead to Sorrel's classic papers on distillation in the early 1890's. This, coupled with the reflux control built into the still, set the stage for the engineers to determine the best way to design a reflux still with an appropriate number of plates. That gave them the ability to design stills that could provide a continuous flow of distillate with any specified degree of purity. While continuous distillation methods provide the volume output demanded by industry, the practice is not well suited to our interests. We just want to separate on occasion, a single compound from a liquid mixture with a small scale still. That’s called batch distillation. Batch distillation stills operate in a completely different way than do the continuous operation stills, and much of the data derived from the theoretical models used to optimize a still running under equilibrium are not directly applicable to the design of a batch still. Fortunately, the reflux column can be used with either batch or continuous distillation operations, and it can be scaled up or down to meet either industrial or home distillation needs. Lujan Cannon(Argentina) Phillips Petroleum Co.